The campsite is a beautifully positioned site that has been certified by the caravan and camping club, and is inspected annually by them. Located in the centre of Dorset we have easy access to all Dorset has to offer all within a ½ hour drive. From Beaches to Historical Market Towns and Family attractions. 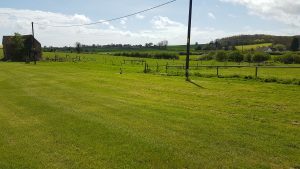 The campsite is situated in the centre of our working farm (dairy, beef, sheep and arable) in the beautiful rolling Dorset Down country side (an official area of outstanding natural beauty). Enjoy waking up surrounded by green pastures and local produce for breakfast. We have a Farm Shop and Tearoom on the Farm, selling; home reared meat, home grown fruit and vegetables, home made cakes plus other local produce. We welcome Children and Dogs there is plenty of space in the camping field plus foot paths and bridleways. We are located just outside the village, the traditional pub offers local food and drink (just in walking distance), and surrounding villages also have fantastic pubs offering something for everyone.